on May 20th, 1918 as the Air Service before becoming a part of the US Army again on June 4th, 1920.
didn't come about till the First World War when aircraft began to take on a wider range of duties. Nothing however, was done about it till after the war had finished in 1918. The following systems are based around the TYPE LETTER of a designation, more on which comes later. In September 1919, the Air Service introduced a classification system in the order of fifteen numerical types. sequence within each type. Eight additional codes were eventually introduced to the system. mid 1918. The name was later changed to the United States Army Air Corps. (USAAC) on July 2nd, 1926.
until after World War II. manpower and aircraft due to the growing Japanese threat and the war already being fought in Europe. dropped and each type letter being henceforth identified by a single letter only. The third and most extensive revision was made on September 18th, 1962, and continues in use to the present day. into alignment with everything else. example of a Fairchild Provider: VC-123B-18-FA. and was built at Fairchild Hagerstown, Maryland. by the Type Letter. For example take a CB-24J Liberator, it's primary role is Cargo transport not Bombing. Z taking precedence over all Status Prefix Letters (e.g. ZXB-24Q-FO). 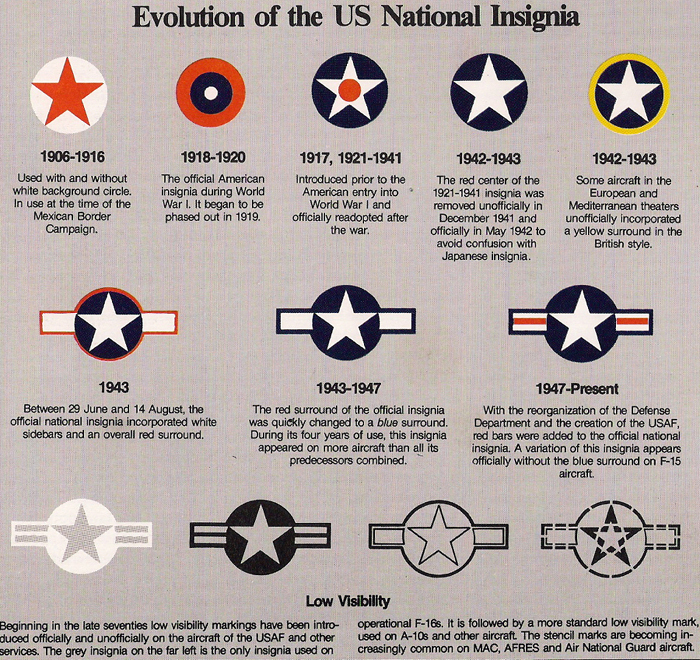 basis for all US Air Force and Army designation systems since it was first introduced in 1919.
for example Helicopter types designated - AH-1 Cobra, SH-3A Sea King, UH-1 Iroquois etc. 1924 and the P-51 the 51st Pursuit design since 1924 etc. by the Lockheed C-5 Galaxy first flown some years later in 1968.
layout, wing or structural upgrades etc., basically a new Series Suffix Letter denoted a new variant. having an A, the third a B and so on. regardless of its status including prototypes (e.g. YF-14A, YC-17A). The letters I and O are not used as these may be confused with numerals. up to the end of the alphabet and in some cases modifications stretched into the hundreds. performance would be reserved for new Suffix Letters only. didn't use them (e.g. the last two batches of the Fairchild C-82). Today Block Numbers have largely been done away with in favor of Lot Numbers as used on the C-17 and F-15. Worth (CF), Douglas Tulsa (DT), North American Dallas (NT) and The Ford Motor Co., Willow Run (FO). Manufacturer Codes are to extensive to list here and are listed where appropriate in the databases. Use of Manufacturer Codes was officially dropped in 1976.
was given a letter to identify it's manufacturer, followed by a number to show its order of procurement. Flying Corps. established in August 1916.
aircraft which also applied to the US Marine Corps. and the US Coast Guard from 1935.
placed under the same designation system as that of the USAF. of a Grumman Hellcat: XF6F-3N. be produced and has a special purpose role of being a Night-fighter. an aircraft was undergoing service tests. This reflects the delivery of different models of the same Type Letter from the same manufacturer. was the F6F Hellcat which like the F4F became legend. both the Consolidated San Diego plant and also the Consolidated New Orleans one. the TBM Avenger designation applied to the same aircraft, but produced by General Motors. USAF and Army used a Suffix Letter to denote their progressive variants. of the F4F Wildcat was designated as the F4F-4P Wildcat. a number 2 following the Suffix Letter (e.g. TBM-3S2). Corps. service as the PBJ-1D and the B-25J the PBJ-1J etc. A Armament (on normally unarmed aircraft). Arrestor gear (on aircraft normally without). Land-based version of carrier aircraft. CP Photographic survey (Trimetrogen camera). Armed (on normally unarmed aircraft). NA Night-fighter modified for day attack. NL Night-fighter modified for cold weather operations. P Photographic reconnaissance / survey. Z Staff / VIP transport.